A native of DeLand, Sarah Zimmerman Fogle earned her bachelor’s degree in Journalism from the University of Florida in 2011. 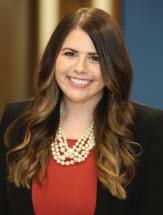 She went on to receive her Juris Doctor from Florida Coastal School of Law in 2015, where she was a member of the Phi Delta Phi International Legal Honor Society and earned book awards for Trusts & Estates and Alternative Dispute Resolutions. Ms. Fogle was introduced to the practice of law at a young age, working with her late father, Mark A. Zimmerman, at James & Zimmerman, PL, in DeLand. After law school, Ms. Fogle was offered an associate position at Landis Graham French, PA, where she developed her estate planning and probate practice. Ms. Fogle is actively involved in the local community, serving on the board of Volusia Flagler Association of Women Lawyers and volunteering in other areas. In her free time, she enjoys traveling and family time with her husband and son. At Cobb Cole, Ms. Fogle’s practice will focus on Probate, Estate Planning and Land Use.